Mara Purl will be interviewed by the crazy mother-daughter team of Big Blend Radio on their Happy Hour show broadcast from Tucson. Just when the fun-time-of-day begins, they start asking questions on any and all subjects . . . so stay tuned for a rip-roaring adventure of an interview! Since Mara will be a guest speaker at the March Tucson Festival of Books, they already have one interesting thing to discuss. 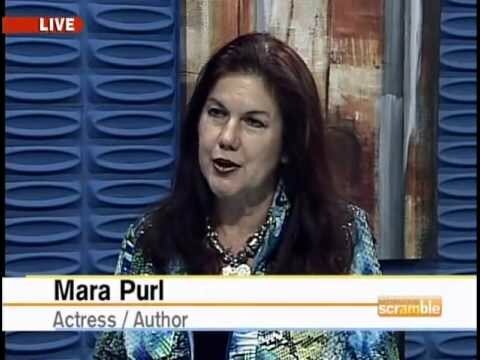 Mara Purl will be interviewed by Minister and Radio Host Shareta Berry on her program “Woman Talk & Empowerment,” which focuses on helping women and teens learn good habits, get education, and move away from destructive or abusive situations, issues close to Mara’s heart! Shereta hosts Woman Talk & Empowerment and several other radio shows in Durham, North Carolina. Mara Purl will be interviewed by Kori Miller whose multiple interactive social media sites, blog, website and radio show cover every angle and aspect of writers – how and why they do what they do. Expect the unexpected when these two experienced pros talk! Mara Purl will be interviewed about her career as an actress, writer-producer, and author on LA Talk Radio’s Question Reality, the premiere Hollywood career show. Priscilla Leona, the high-energy host, is dedicated to helping her listeners “question the reality of the business” as they work to match their talents with actual opportunities by interviewing successful professionals. Though the show is fun and upbeat, Priscilla digs deep to get at the reality of “the Biz.” As a “triple-threat” Mara will share stories about transitioning from her successful acting work to creating her own serial drama and then adapting it into her Milford-Haven Novels. Mara Purl is interviewed about her book Where the Heart Lives on one of the premier radio programs that features authors exclusively. Linda Thompson, the well-known and insightful radio and television talk show host, trains her laser-like focus on Mara and book two of her best-selling saga, probing the reasons she wrote the book, her themes, who her readers are, and what they can hope to gain by reading Mara’s book. Mara will share insights into why her saga means so much to her readers, and how she created her multiple award-winning saga, the Milford-Haven Novels. La Literati hosts Tisha and Niles are happy to welcome back author Mara Purl to our show. She was our first guest. Mara pioneered small-town fiction for women with her popular and critically acclaimed Milford-Haven Novels. Her beloved fictitious town has been delighting audiences since 1992, when it first appeared as Milford-Haven, U.S.A- the first American radio drama ever licensed and broadcast by the BBC. The show reached an audience of 4.5 million listeners throughout the U.K. Her books and stories include “Where The Heart Lives” and “When Otters Play”. She also talks about her recent co-starring role in Sea Marks and her long-time connection to California’s Central Coast. Mara Purl will be interviewed about her career as an actress, writer-producer, and author returning to LA Talk Radio’s Question Reality, the premiere Hollywood career show. Priscilla Leona, the high-energy host, is dedicated to helping her listeners “question the reality of the business” as they work to match their talents with actual opportunities by interviewing successful professionals. Though the show is fun and upbeat, Priscilla digs deep to get at the reality of “the Biz.” As a “triple-threat,” Mara will share stories about her recent performances, and her two upcoming publications: the short story When Otters Play and the new novel Why Hearts Keep Secrets. Mara Purl will be interviewed about the integrating of her career as an actress, writer-producer, and author returning to LA Talk Radio’s Question Reality, the premiere Hollywood career show. Priscilla Leona, the high-energy host, is dedicated to helping her listeners “question the reality of the business” as they work to match their talents with actual opportunities by interviewing successful professionals. Though the show is fun and upbeat, Priscilla digs deep to get at the reality of “the Biz.” As a “triple-threat” Mara will share stories about her recent performances, and her two upcoming publications: the short story When Otters Play and the new novel Why Hearts Keep Secrets. http://www.kcmj.org/ and click on “Listen Live” on the upper right. Mara Purl, featured author this month at the Pikes Peak Library District “Mountain of Authors” event, will be interviewed about the genesis of her best-selling book series, The Milford-Haven Saga, including its roots as a BBC radio drama and Mara’s own background as a “hyphenate” author-producer-performer. Judith McKay’s delightful, in-depth conversational style allows the show to evolve in surprising directions, including hints about Mara’s upcoming short story When Otters Play and the new novel Why Hearts Keep Secrets.